She’s young, stylish, sharp and pretty, and Indians are falling for her. Yep, it seems that Pakistan’s new 34-year-old foreign minister, Hina Rabbani Khar, has accomplished what years of tense diplomacy haven’t been able to — create some genuine goodwill between the two constantly sparring nations. 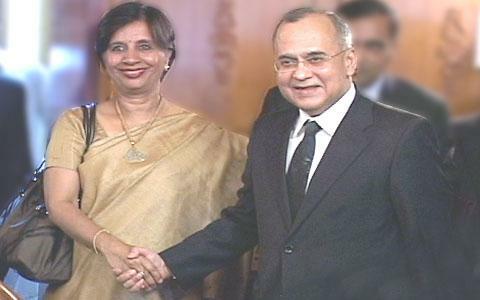 In her first official visit today to India since taking over the foreign ministry last week, Khar met with her Indian counterpart, S.M. Krishna. The two agreed to boost security, trade, transportation, travel, and cultural links between the countries — in what analysts called some of the most productive talks between the two sides since Pakistani militants killed 166 people in Mumbai three years ago. But it’s her youth and glamour that are credited with creating a “fresh start atmosphere.” She later met with India’s Prime Minister Manmohan Singh. But who really cares what happened behind closed doors. More importantly: she got high marks for wearing Roberto Cavalli sunglasses, classic pearl and diamond jewelry, a blue designer dress, and toting an Hermes Birkin bag. And thus ladies and gentleman, a glamour icon is born. We give it three months before Vogue comes calling… wait, maybe two. Indian papers and news programs today gushed over Khar, praising her beauty and style. The Times of India headlined their front page story: “Pak Puts On Its Best Face.” The Navbharat Times said the country was “sweating over model-like minister.” The Mail Today said she had brought a “Glam touch to Indo-Pak talks” and asked, “Who says politicians can’t be chic?” These are not the usual superlatives Pakistani diplomats are used to getting in the Indian press. Of course, not everything was picture perfect. The Indian press did attack her for meeting with a Kashmiri separatist group later in the day. But overall, it was hard not to sense the generational shift as Khar spoke about “a new generation of Indians and Pakistanis [who] will see a relationship that will hopefully be much different from the one that has been experienced in the last two decades” after meeting with the Indian foreign minister who — through no fault of his own, save for his misfortune of being born 79 years ago — did totally look like her grandfather. U.S. Secretary of State Hillary Rodham Clinton said Tuesday that the United States was “encouraged” by the ongoing talks between nuclear-armed rivals India and Pakistan and promised to give full support to Indian efforts to protect itself from terror. Clinton’s visit to India came less than a week after a triple bombing killed 20 people in India’s financial capital of Mumbai, the worst terror strike in the country since 10 Pakistan-based gunmen rampaged through the city in 2008. Her meetings with top Indian officials Tuesday focused on fighting terror, the U.S. withdrawal plans from Afghanistan and ways to broaden economic and security ties between the United States and India. She also called for a swift resolution to their dispute over investments in nuclear energy, calling on India to ratify by the end of the year the Convention on Supplementary Compensation for Nuclear Damage and to adapt its liability laws to conform with the treaty. The U.S. views India’s new nuclear liability law as too stringent on nuclear plant suppliers, making it difficult for private U.S. companies to compete against state-owned companies in India’s multibillion dollar nuclear reactor market. Clinton’s trip here is part of a new round of U.S.-India strategic dialogue established last year to deepen ties between the world’s oldest and largest democracies. S.M. Krishna, India’s foreign minister, expressed concerns that the planned U.S. troop withdrawal from Afghanistan that began this month could lead to a resurgence in Islamic extremism. “It is in the larger interests of the region that it is necessary for the United States to work very closely with (Afghan) President (Hamid) Karzai and the government of Afghanistan and thereby create conditions where terrorists do not take any more advantage in Afghanistan,” Krishna said after 2 1/2 hours of talks with Clinton. Clinton said she had outlined the drawdown strategy and stressed that the United States will not support Afghan reconciliation with insurgents unless it is inclusive and protects the rights of minority groups, religions and women. Clinton also assured India of U.S. support in the fight against terror. “We are allies in the fight against violent extremist networks. And homeland security is a high priority and a source of increasing partnership,” Clinton said. While the U.S. and India have already signed agreements to cooperate in counterterrorism efforts, “the events in Mumbai have driven home how important it is that we get results,” she said. Though India has not blamed Pakistan for last week’s attack, it has accused its neighbor of harboring violent extremist groups responsible for other attacks in India and of not doing enough to crack down on those responsible for the 2008 Mumbai siege. For its part, U.S. officials fear Pakistan is not fully committed to combatting radical plots, such as the failed 2010 Times Square bombing in New York. “We have made it clear to the Pakistani government that confronting violent extremists of all sorts is in its interest,” Clinton said. India recently resumed peace talks with Pakistan that broke off following the 2008 Mumbai siege, and the two countries’ foreign ministers are expected to meet next week. The U.S. is eager for the fragile talks to pick up steam, in part to allow Pakistan to focus its forces on the chaotic Afghan border. “We are encouraged by the dialogue between India and Pakistan,” Clinton said, calling talks “the most promising approach” to build more confidence between them. During the meeting Tuesday, Clinton and Krishna agreed to strengthen their countries’ ties in energy, security, education, the economy, science and promoting stability across the region. The two countries also signed an agreement promoting closer cooperation in cybersecurity. Once frosty relations between India and the United States have warmed considerably in recent years as Washington has looked to India as stable ally in the turbulent South Asia region and its growing economy as a valuable market for U.S. goods. President Barack Obama hosted Prime Minister Manmohan Singh at his first state dinner and visited India for three days last year, praising it as a new regional power. Clinton was to meet with Singh later Tuesday. Growing business ties were among the top issues in the talks. Western officials have looked to India’s rising economy and its 1.2 billion people as a coveted market to help stimulate growth in their own troubled economies. She praised India’s fight against piracy, and pushed for greater sales of U.S. arms to India — the world’s largest arms importer —as a way of deepening security cooperation between the two nations. U.S. officials were annoyed earlier this year when Indian officials chose two European companies as finalists for an $11 billion order for 126 fighter jets. However, last month India signed an agreement to buy 10 Boeing C-17 cargo and troop-carrying aircraft for more than $4 billion. From New Delhi, Clinton on Wednesday will move on to the southeastern port of Chennai, where she plans to deliver a speech on the importance of U.S.-Indian relations, the benefits of enhanced bilateral commercial ties and India’s role in South Asia and the greater Asia-Pacific region. Clinton is in India on the third leg of a 12-day, around-the-world diplomatic tour that has already taken her to Turkey and Greece. After India, she will visit Indonesia, Hong Kong and southern mainland China before returning home July 25. 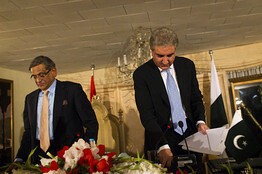 The Times of India reported today that India and Pakistan may try to rekindle peace talks in early February. The paper says Pakistan Foreign Minister Shah Mehmood Qureshi could meet his Indian counterpart, S.M. Krishna, informally after a regional meeting in Bhutan on Feb. 8. The report suggests that the idea is to set the ground rules for an official visit to India by Mr. Qureshi sometime later this year in a bid to normalize relations that have soured since a major terror attack in Mumbai in 2008. Given the disastrous outcome of Mr. Krishna’s last formal visit to Pakistan – in July of last year – those ground rules will be important. At that meeting, Mr. Qureshi became incensed during a press conference over India’s claims that Pakistan’s military intelligence services had orchestrated the Mumbai attacks in November 2008, during which 10 Pakistani gunmen killed more than 160 people over three days. Mr. Krishna arrived back in India to criticism of being made to look a fool by Mr. Qureshi and a peace talks process begun in 2004 was put on hold amid mutual recriminations. The slow-moving (and now stalled) dialogue is an attempt to normalize relations that have been rocky ever since the two nations were created out of British India in 1947. India has stuck to its claims of official Pakistan involvement in the Mumbai attacks and says Islamabad is not doing enough to prosecute the perpetrators and rein in India-focused militants in general. Pakistan retorts that it is committed to fighting terrorism. It also has called on India to broaden the agenda for peace talks to include other topics, such as the disputed Himalayan territory of Kashmir, which both countries claim in its entirety. India is set against any wider peace talks until Pakistan sentences seven militants that it has charged for involvement in the Mumbai attacks. But the atmosphere in Pakistan right now means it is unlikely that any politician will want to be seen vigorously cracking down on Islamist groups. The killing earlier this month of Salmaan Taseer, governor of Pakistan’s Punjab province, by one of his own police guards has uncovered the extent to which hardline religious views have permeated many layers of society. The police guard admitted he was angered by Mr. Taseer’s defense of a Christian woman sentenced to death by a Pakistani court in November for blasphemy. In recent days, scores of Pakistanis, including lawyers and clerics, have publicly rallied in support of the police officer. BANGALORE – A recent report in the Chinese media describing the Sino-Indian border as being 2,000 kilometers long, roughly 1,500 km shorter than that defined by India, has evoked an alarmed response among sections of the Indian strategic community. The “missing 1,500 km” from the definition of the Sino-Indian border is seen to be a clear pointer to Beijing’s hardening position, not only on its long-standing boundary dispute with India but also on Jammu and Kashmir (J&K). While India holds about 45% of J&K territory and Pakistan controls 35%, China occupies about 20% (including Aksai Chin and the Shaksgam Valley, ceded by Pakistan to China in 1963). A Beijing-datelined Xinhua news agency report of an official briefing by China’s Assistant Foreign Minister Hu Zhengyue on the eve of Prime Minister Wen Jiabao’s recent visit to India triggered the flap. “China and India share a 2,000-km-long border that has never been formally demarcated,” the report said. India describes the border as being 3,488 km. Reports in state-owned media have been describing the border as being 2,000 km for at least a year now. The roughly 1,500 km-long shortfall in the Chinese perception is believed to refer to the Sino-Indian boundary in J&K. “China apparently no longer treats the line of nearly 1,600 km separating Jammu and Kashmir on the one hand and Xinjiang and Tibet on the other as a border with India,” strategic affairs expert C Raja Mohan wrote in the Indian Express. That is, it does not recognize Kashmir to be part of India. Beijing is questioning India’s locus standi to discuss J&K’s border with China, observes B Raman, a retired director in India’s external intelligence agency, the Research and Analysis Wing (RAW). In essence, it is seeking to exclude discussion of the western sector of the disputed Sino-Indian boundary with India. The western sector includes the large chunk of Indian territory, Aksai Chin, in the Ladakh region of Jammu and Kashmir that China occupied in 1962. Besides, China “wants to change the format of the border talks in order to keep it confined bilaterally to the eastern and middle sectors and expand it to a trilateral issue involving India, China and Pakistan in the western sector,” Raman wrote recently. China has become increasingly assertive in its questioning of India’s sovereignty over J&K. Since 2008, it has been issuing visas on a separate sheet of paper to residents of Jammu and Kashmir rather than stamping the visa in their passports, as is the norm with other Indian citizens. In August last year, China also denied a visa to Lieutenant General B S Jaswal – commander of the Indian army’s Northern Command, which includes Kashmir – for an official visit to China, on the grounds that he “controlled” a “disputed area”. Besides, over the past year, Beijing has been reaching out to the Hurriyat Conference, an umbrella organization of Kashmiri separatist outfits. In March 2010, for instance, Chinese Foreign Affairs director Ying Gang met with Hurriyat leader Mirwaiz Umar Farooq in Geneva on the sidelines of the 13th session of the UN Human Rights Council. Besides questioning India’s sovereignty over Kashmir, China has been endorsing Islamabad’s control over the part of Kashmir it has administered since 1947. It was with India that the Maharajah of Jammu and Kashmir, Hari Singh, signed an Instrument of Accession in October 1947. However, only 45% of the territory of the former princely state is in India’s hands today, roughly 35% remaining under Pakistani administration and another 20% under Chinese control. The territory under Chinese occupation includes Aksai Chin and the Shaksgam Valley that Pakistan gifted to China in 1963. In the Northern Areas of Pakistan-administered Kashmir, China is involved in the construction of several infrastructure projects, including roads, hydroelectric power projects, dams, expressways, bridges and telecommunication facilities. During Wen’s recent visit to Pakistan, the two countries signed a US$275 million agreement for repair and expansion of the Karakoram Highway. Earlier in September, Beijing underlined its support to Islamabad’s territorial claims over parts of Pakistan-administered Kashmir when it described the Northern Areas as “a northern part of Pakistan”. 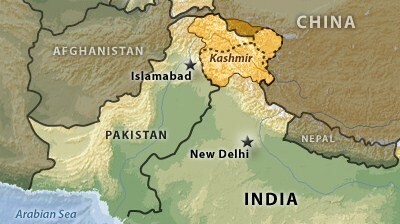 The India-Pakistan dispute over Kashmir predates the People’s Republic of China (PRC). India and Pakistan had already fought their first war over Kashmir when the PRC came into being. Initially, China took its cues from the Soviet Union on the issue. It described the conflict as a Western creation and maintained that the US and Britain were hoping to make Kashmir a Western base. China took a “neutral position” in the 1950s. It opposed foreign arbitration on the Kashmir issue, which pleased India. At the same time, it did not endorse Delhi’s claims over Kashmir. Fraying Sino-Soviet relations and Moscow’s overt support to Jammu and Kashmir as “an inalienable part of the Republic of India”, as well as concerns that its backing of India would push Pakistan into a closer embrace of the US, seem to have prompted it to adopt a more “neutral position” between India and Pakistan on Kashmir. With Sino-Indian relations deteriorating from 1959 onwards, China began tilting towards Pakistan. It signed a border agreement with Pakistan. Since this dealt with areas that constituted Pakistan-administered Kashmir, the agreement amounted to a de facto Chinese recognition of Pakistan’s control over this area. Although it subsequently denied such recognition, describing this as “provisional” and “pending settlement of the Kashmir dispute”, a joint communique issued at the end of prime minister Zhou Enlai’s visit to Pakistan in February 1964 was a strong endorsement of the Pakistani position. It urged a solution of the dispute “in accordance with the wishes of the people of Kashmir”. India is opposed to a plebiscite in Kashmir. By the mid/late 1970s, China began advocating a status quo on Kashmir. Support for the Kashmiris’ right to self-determination was toned down. In 1976, in his speech before the UN General Assembly, Chinese foreign minister Chia Kuan-Hua omitted naming Kashmir in a list of territories where the right to self-determination had not been exercised. It is believed that China’s own troubles with separatism and improving ties with India prompted its shrinking support on self-determination. With Sino-Indian rapprochement gathering momentum in the 1990s, China began describing Kashmir as a bilateral matter to be resolved by India and Pakistan through peaceful means. On his visit to India in 1996, president Ziang Zemin called on India and Pakistan to set aside contentious issues and build a cooperative relationship. During the brief Kargil conflict in 1999, China called on India and Pakistan to respect the Line of Control that separates Pakistani- and Indian-administered Kashmir. These were seen as signs of Beijing taking a neutral position on Kashmir again. China has never accepted India’s sovereignty over Jammu and Kashmir, even over the part that is under its control. After all, if it did it would mean giving up the roughly 43,180 square kilometers of territory that is currently under its control. However, it had avoided provoking India on the matter publicly. This has changed in recent years, with Beijing being “deliberately provocative” on Kashmir. India is not letting the repeated provocations go unchallenged. After all, the territorial integrity of the country is a core concern of the Indian state. A couple of months ago, in his talks with Chinese Foreign Minister Yang Jiechi, India’s External Affairs Minister S M Krishna did some tough talking. According to officials quoted by the Hindu, for the first time India drew a parallel between “the territorial red lines” of the two countries. Krishna reportedly told Yang that just as India had been sensitive to its concerns over Tibet and Taiwan, Beijing too should be mindful of Indian sensitivities on Jammu and Kashmir. The message that India is sending is that if China questions India’s sovereignty over Kashmir, India will question Beijing’s sovereignty over Tibet and Taiwan. Delhi has indicated that Krishna’s warning was to be taken seriously. The joint communique issued at the end of Wen’s visit to India made no reference to India’s commitment to a “one china policy”. This is the first time since 1988 that a summit-level joint communique has made no mention of the policy. Instead, both sides agreed to show “mutual respect and sensitivity for each other’s concerns and aspirations”. -Sudha Ramachandran is an independent journalist/researcher based in Bangalore.